Type Of Medium: "acrylic on canvas"
Title Of Art: "The Horse And Rider"
Quote From The Artist: "Galaxies through running space are in this painting." 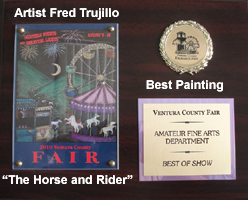 History Of This Painting: The plaque and first place ribbon was awarded at the Ventura County Fair in 2010. 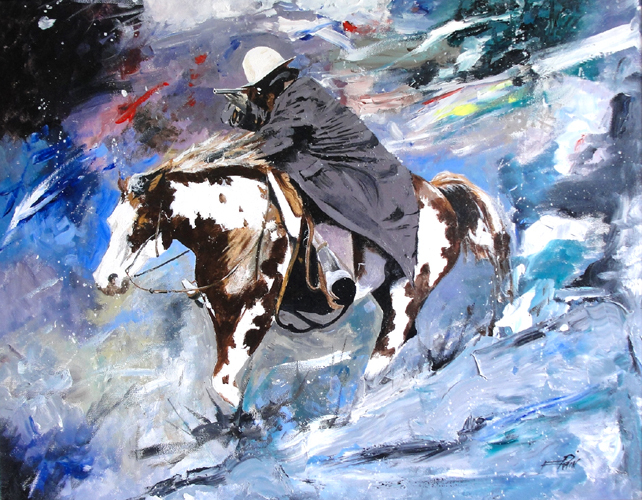 The award specified "The Horse And Rider" as the best of show through the fine arts department. Artist Description & Words About This Painting: This piece was inspired while I was visiting New York galleries. When I arrived back home, I started painting till completion. 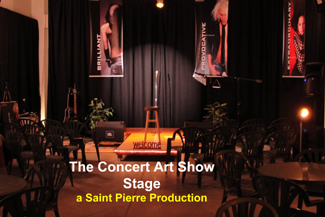 The Concert Art Shows are produced by Saint Pierre & based in Downtown Ventura in the Cultural Arts District. 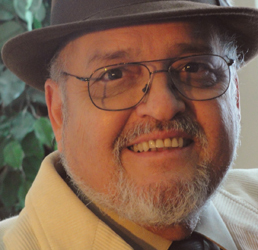 Established in 2009, our mission is the convergence of the visual arts & the performing arts together. The shows started touring on the road throughout Southern California in 2012. Enjoy gourmet dinner and drinks for your pleasure. Proceeds benefit the artists and our non- profit cause: Music & Art For Youth". The stage, the art, and our venue are pictured above. "Every Concert Is An Art Show".